There have been many reviews of various Tablet PCs, but these reviews focused on the hardware involved. There have also been several reviews of Windows XP Tablet PC, but these generally amounted to feature lists rather than real investigations into the usefulness of Tablet PC. But most importantly, Tablet PC as a product is really fusion of unique hardware and software. In this review, I take an in-depth look at how useful Tablet PCs really are – and whether or not they are worth the tradeoffs and cost. To do this, of course one needs a Tablet PC, and for this review we will be looking at the HP Compaq tc1100, a rather unique tablet. For those unfamiliar with Tablet PC, Windows XP Tablet PC edition is based on Windows XP Professional with added “ink” features. The idea of pen-based computing has been around for a long time, as the idea of using a pen is actually fairly obvious. However, it was not until 2003 that this idea became a commercial reality. Some may argue that such products as IBM’s Pen for OS/2 or Apple’s Newton were first (insert other unlikely candidates here), but the truth is the total market penetration of these products was essentially zero and they were discontinued. Clearly they were missing something. The Palm, and later Pocket PC, experienced initial success but suffered from that fact that it was not a pure ink system, and was instead a method of using ink to input characters one at a time. Palm and Pocket PCs units with built-in keyboards have remained quite popular. Probably the most important aspect of pen computing, or as Microsoft calls it – Ink – is the scope. In what situations is Ink actually superior to a keyboard, or even voice recognition? What kinds of applications should make use of Ink? Is there a way to combine Ink and other input methods (such as a keyboard)? Does the inking hardware involved work well? What about people with poor handwriting – or cursive? Perhaps the biggest problem with early attempts at pen-computing was that they did not adequately address these questions. 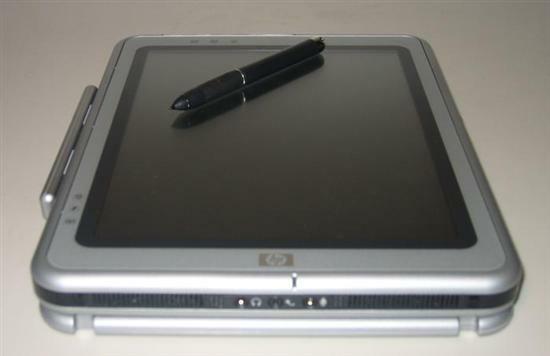 In this review, we will use the latest version of Tablet PC, Windows XP Tablet PC Edition 2005 and the HP tc1100 to try to answer these questions thoroughly.